Express yourself with "feeling words." 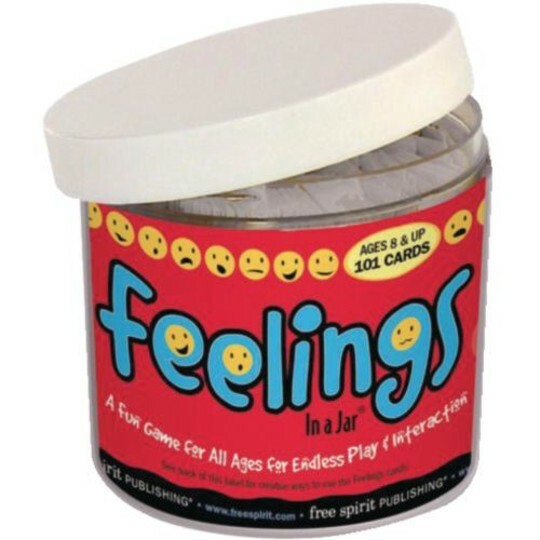 Help them name and express feelings. Each jar holds 101 discussion cards. "Feeling words" include gleeful, insecure and grateful. Have them pull a slip and act out the feeling. Everyone needs to know how to name and express feelings. Each jar holds 101 little cards printed with "feelings words" - gleeful, insecure, grateful, angry, cranky, courageous, hopeful and many more. Pull a slip and act out the feeling, or invite someone else to act it out. Use as discussion starters, journaling prompts or icebreakers for groups. 101 discussion cards. Ages 8 and up.